The mission of the Sufficiency of the Scripture conference is to help Christians discern and uphold the all-sufficiency of God’s Word in their faith and daily living amidst a world that celebrates relativism, psychology, secular philosophies, and extra-biblical thinking. 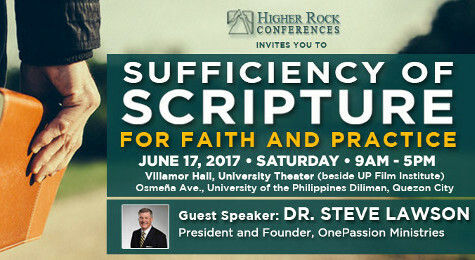 Join us on June 17, 2017 from 9 AM – 5 PM in Metro Manila to hear Dr. Steve Lawson expound on how “All Scripture is God-breathed, and is profitable for teaching, for reproof, for correction, and for training in righteousness.” We shall be posting here the exact venue as soon as we can finalize our arrangements with them. What does the sufficiency of God’s Word mean? Why is God’s Word sufficient for doctrine and conduct? How should the sufficiency of God’s Word shape the way we live? How relevant is God’s Word in today’s world? What is the place of psychology, human philosophy, and other worldviews in the life of a Christian? If you want to know more details about this conference, just download this brochure. Dr. Steven J. Lawson is the President and founder of OnePassion Ministries, a ministry designed to equip biblical expositors to bring about a new reformation in the church. Dr. Lawson hosts The Institute for Expository Preaching in various cities around the world. Dr. Lawson is also a Teaching Fellow for Ligonier Ministries, where he serves as board member. Moreover, he is Professor of Preaching and oversees the Doctor of Ministry program at The Master’s Seminary, where he also serves in the board. Further, Dr. Lawson is the Executive Editor for Expositor Magazine published by OnePassion Ministries. Dr. Lawson has served as a pastor for 34 years in Arkansas and Alabama. Most recently, he was senior pastor of Christ Fellowship Baptist Church in Mobile, Alabama. He is a graduate of Texas Tech University (BBA), Dallas Theological Seminary (ThM), and Reformed Theological Seminary (DMin). Dr. Lawson is the author of 24 books, his most recent being The Passionate Preaching of Martyn Lloyd-Jones and The Daring Mission of William Tyndale. His books have been translated into many languages, including Russian, Spanish, and Indonesian. If you want to see the restaurants and accommodations around the area please click here. And then follow the instructions on infographic posted below. Who can join and participate in this Conference? This conference is for anyone – male or female, young or old - who wants to understand the extent of the truth that, God’s Word is enough to shape the way we live today and address a person’s daily needs. Can I invite friends/colleagues to join the conference? b) liking our FB page and sharing our materials there to your family members, friends and colleagues. Select the conference to register and accomplish the on-line form in the succeeding pages. Once you have completed the form, an email will be sent you with instructions for confirming your registration. REGISTRATION FEES ARE NON-REFUNDABLE BUT TRANSFERABLE. The registration fee is inclusive of the conference manual and some light snacks. Where can participants have their meals? Because the venue management discourage the sale of food in their premises, the Conference Team will be providing conference attendees maps showing nearby eating establishments to visit during the designated schedules for lunch, snack and breaks. In keeping with the soberness of the event and the office that many of our registrants hold, we would like to highly encourage that attendees be in their smart casual or work attire. The conference venue could get a bit cold and so we suggest that you also bring your sweaters, light jackets or shawl to keep yourself warm. Seating will be on a first-come, first-served basis for both days. This conference is organized by HIGHER ROCK CONFERENCES, the ministry arm of Higher Rock Christian Church. This ministry aims to edify and equip churches and believers by organizing Christian conferences that are biblically-grounded and Gospel-saturated, with well-credentialed godly speakers from all over the world. What if I have some other specific concerns about registration? We are very thankful and excited about your attendance to the conference Sufficiency of Scripture. If you have successfully registered or received a tentative registration notice from our team, then you should have received these information through your email as well. For your guidance and convenience, we request and encourage you to carefully go through the following information. We pray that these will help in your preparations. The Conference Venue is the Villamor Hall, UP Theater, Osmeña Avenue, University of the Philippines, Diliman Quezon City. On Jun 17, Conference check-in starts at 8AM and session starts at 9AM. However, some registration counters will be open by 7AM for early-comers. The venue is within the vicinity of several schools, colleges and universities so plan your route to the Venue and give ample allowance for possible traffic. Parking is available at the venue premises on first-come-first-serve basis. If you have a smartphone, save your QR code in your phone’s file folder. You may also present any valid ID. Provide your replacement participant with a copy of the Registration confirmation with your QR Code image, which we emailed you. Advise your replacement participant to come early to the Conference venue on Jun 17, bringing a copy of your QR Code or Registration confirmation email. This will facilitate the transfer process and Conference check-in. If you have registered online and paid through bank deposit, but did not receive a registration confirmation email, please bring a copy of the bank validated deposit slip. To facilitate verification of your payment and Conference check-in, we encourage you to come early to the venue. If you have not paid but are keen to attend the conference, we encourage you to come early to the venue for payment of the registration fee. The Theater is air-conditioned so we advise to bring a jacket to keep you warm during sessions, if needed. Good Christian books will be sold so if your budget allows, have some money handy to buy materials for your personal or ministry use. Packed lunches and snacks will be sold at the conference venue. Aside from these, there is a wide variety of affordable eating establishments nearby. Food and drink, except bottled water, is prohibited inside the Theater. Eating is prohibited on carpeted and cordoned areas. Smoking is not permitted anywhere within the premises of the University. Keep your belongings well attended at all times.